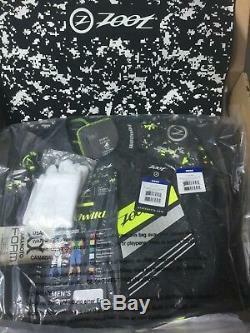 This ZOOT WIKIWIKI triathlon wetsuit is brand new with tags never worn in an original box. The all new Wikiwiki Wetsuit, Hawaiian for "speedy fast", delivers the most cutting edge performance features. Designed with premium Yamamoto neoprene, this suit is the fastest of its kind. 5mm super stretch sleeve design is fully coated with SCS Nano for the ultimate combination of flexibility and speed. The FLEXskin and PROarm Panel allow you to have full feel of the water. Six strategically placed FLEXlift AEROdome panels on the front of the suit provide exceptional balance and allow for maximum rotation. Feel your stroke and enjoy maximum floatation in the new Wikiwiki wetsuit. FLEXlift Yamamoto SCS AEROdome - 6 strategically placed panels for exceptionally balanced buoyancy place the body high in the water and allows for maximizing rotation. Balanced rotation is the key to achieving the maximum distance per stroke. FLEXskin 0.5 mm - super flexible neoprene is fully coated with SCS Nano for the ultimate combination of flexibility and speed. This thin neoprene conforms to the body for the most natural feel in the water, allowing the swimmer to have their most powerful natural glide. SCS Nano hydrodynamic finish - Delivering the most hydrodynamic and durable wetsuit coating available, Super Composite Skin (SCS) Nano reduces friction between the wetsuit and the water. SCS Nano improves swimming speeds by reducing drag, allowing the suit to glide through the water more efficiently. AQUAlift buoyancy panels - panels in the lower core and rear raise the legs and torso to put the body in the most effective swimming position for maximum power and speed. COMFORTcell Platinum 88% Nylon, 12% Spandex. Super thin low profile neck with fuse welded SCS Nano. 2mm Speed Release Ankle Panels. OKD - Optimal Kick Design - Zoots proprietary leg patterning works with the anatomy of the swimmers legs to increase kick velocity, frequency, and efficiency. The unique pattern reduces leg muscle fatigue allowing for a stronger kick throughout the entire swim. FLEXback design with 100% broken knit Nylon - A premium patterned design throughout the back and shoulders of the wetsuit that uses a 2mm Yamamato #40 neoprene. The flexibility in the back and the shoulders allows for full range of motion during the catch and recovery phase, reducing shoulder fatigue. The interior fabric features BGX broken knit structure lining to maximize stretch. PROarm proprioception panel - During the catch phase, the PROarm proprioception panel allows for stroke feedback, promoting flawless technique and maximum power transfer. The PROarm Panel is constructed of an ultra-thin hydrophobic stretch fabric on the leading edge of the forearm with a raised dot pattern for the ultimate sensory experience. Durable Melco Tape and spot reinforcements. Includes changing mat and gloves. The item "Zoot Men Wikiwiki Full Triathlon Wetsuit Size Large Black/Yellow BNWT" is in sale since Thursday, February 14, 2019. This item is in the category "Sporting Goods\Outdoor Sports\Triathlon". The seller is "major_sales" and is located in Berlin. This item can be shipped worldwide.